Turns out it's a pretty simple mechanism actually... there's a base plate (the "shoe"), and a clamping "thing". 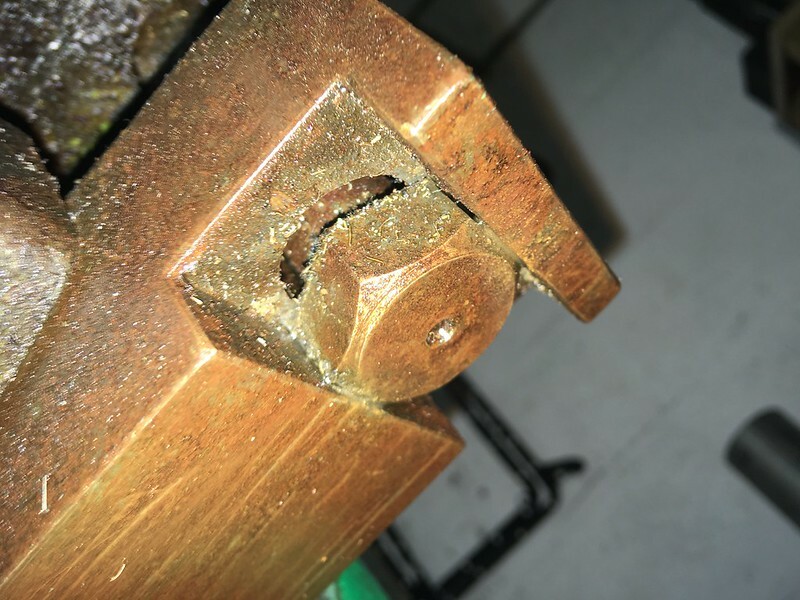 The bar that goes up from the "shoe" to the lever is threaded, as you turn the lever it tightens, raising the base plate which squishes the clamping "thing" against the underside of the ways. 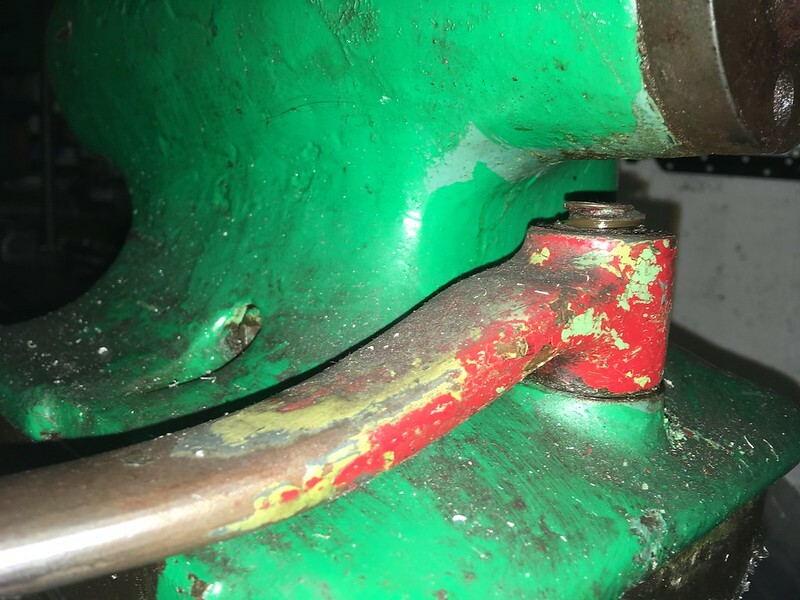 Looking at your photo Matt, I think all you need to do is to tighten that threaded bar up so it's just touching the bottom of the shoe when the lever is at the back of the tailstock. I'm going to take a wild guess that it'll be quite stiff, I'm assuming the lump on the bottom is designed to bind slightly in the "shoe" so the lever tends to tighten on the thread, rather than just rotating the whole piece. If not, then I'd tighten it anyway, then wedge a shim in there so that it binds up. To adjust the tail-stock lever, remove tail-stock, rotate the clamping bolt to screw into the handle. it is probable that the clamping mechanism has turned a full turn when it was removed at some stage. I would start by removing the tail-stock and turning the whole locking shoe a full turn so that the that the acme screw screws into the handle, thus shortening it. I don't understand why the image won't open on it's own, it's a .pdf! You shouldn't need shims, take of the head stock, rotate the locking shoe so that the locking bolt screws into the handle a turn and try it again. As I said before, it is probable tha the locking mechanism was turned a full turn when somebody removed it. It won't have worn enough to no longer lock in it's life time! If the bolt rotates, then there is a problem with the shoe. The slot should be straight cut and a close fit to the head. The design is not unlike the Boxford, and I dare say, a lot of other lathes, in that you can adjust the length of the screw by 1/6th of a turn by pushing the shoe up so that the head of the bolt disengages with the slot, then rotating it. From the picture in post #20 it does rather look as though someone in the past has replaced the hex headed bolt with one that had a larger head that has been turned down to fit the slot, but doesn't grip - unless as I said in an earlier reply the circular head is actually eccentric and locks against the shoe. Has the previous owner turned the hex (or square) head off the bolt? I just went back to the original pick, I had missed that it had been turned round. Andrew's solution is probably the easiest if you haven't got a welder to put a ridge on the head of the bolt. Normally the hex head is held in place in the groove. Although Andrew's solution is viable, it will leave slack in the movement. Four welds to transform the head into a squar would eliminat play! A grub screw (or 2) from the side could lock the round head. The width of the block could be a snug fit in the slot in the shoe. So I'd be tempted to go with Matt's solution: Adjust so it works, then weld to the bolt head so it jams in the shoe. 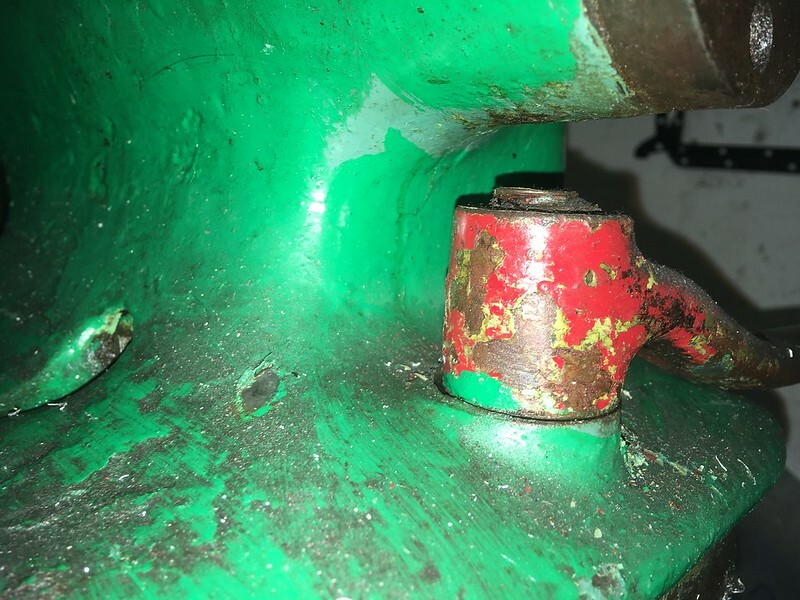 I have found a nut the correct size- so I am going to turn the "lump" on the end of the bolt down to the size of the hole in the nut, then weld it on. Then it will be as it was originally. I will post some pics when i've done it, but thanks for all the info guys. Hi again, I have fixed the clamp by turning the old bolt head down and welding a nut on the end as I had planned. Have attached a pic, not the smartest job I'v ever done but it seems to do the job! Thanks again for all the info. I am another EDGWICK 6.5-inch Lathe Mk. 1 owner . Mine is fitted with a Pratt Burnerd 1210-02505 Precision 250mm chuck with 0.015" run out. Hi HH, There is a limited amount you can do with a three jaw when it gets worn, but you can usually improve the situation somewhat. first, take the chuck off the lathe, strip it down, looking for any damage or looseness in the jaws and the scroll, clean it, oil it, and rebuild it. Check the lathe nose threads, and the register to for any damage or dings and if you find any, stone them off so you know the chuck is properly seated on the lathe, oil the thread and put the chuck back on the lathe. Get a known good piece of , say 1" plus dia bar, put it in the chuck, with the end right at the back of the jaws, tighten it firmly,and watch the jaws carefully as you do it to see if you can see the jaws rising in their slots and use a DTI to check the runout. Any better? 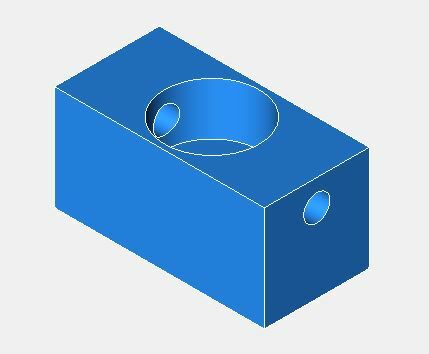 If the chuck has adjusting screws adjacent to the backplate bolts, you need to slacken the backplate bolts very slightly, and adjust them to dial the chuck in on the DTI. If there is play between the register on the backplate and the chuck, you can slacken the bolts holding the chuck to the backplate, and bump the chuck with a hide mallet and see if you can improve it that way, or make a mark on the backplate and the chuck, then remove the chuck from the backplate and see if you get better concentricity by turning it one set of fixing holes, and refitting it. At the end of the day, you can put each job in the chuck, then bump it with a mallet and check with a dti, till you get it "near enough". remember a 3 jaw chuck will have 3 to 4 thou run out when new! Mine, on a Colchester Student mk1 ran out about 17thou, but with care, this could be reduce to about 6 thou which was adequate (barely) but I used it until I was able to get a new (to me) chuck! Don't sweat it, make what you want to make on it, and if the parts aren't accurate enough, look for another chuck. Can you post up some pics, of the lathe and the chuck, especially the side faces of the chuck so we can see if it has adjustment screws or not. Have you measured the runout on the chuck body? If yes, what do you get? Put the lathe in it's slowest gear (17rpm), now grab hold of the chuck and try to wobble it up/down and/or back/forth. Any discernable movement (have a dial indicator set up on the chuck body if you can't feel anything). If it's definitely moving about, it may well be wear in the spindle bearings. If there's no major movement in the spindle bearings, the next step is to remove the chuck. Undo the 3 bolts that hold it to the spindle nose, and withdraw carefully. If it's anything like mine, you have to back them off until they're virtually touching the headstock, then wobble the chuck off, then finish undoing/removing them. Set aside. Now carefully examine the register in the chuck - any crushed swarf in there? It wouldn't take much of a chip to throw the alignment off. Check the spindle nose for similar. If there's no swarf in there, put your dial indicator up against the spindle nose & check for runout again. If you've got runout at the spindle, the bearings need replacing. if it runs true, your chuck is bad. Try wobbling the spindle again; you should see nearly no movement in the DI. If you can't find any wobble anywhere, put the chuck back on (but not the nuts at this point). Push the chuck all the way home & try to wobble it on the register. 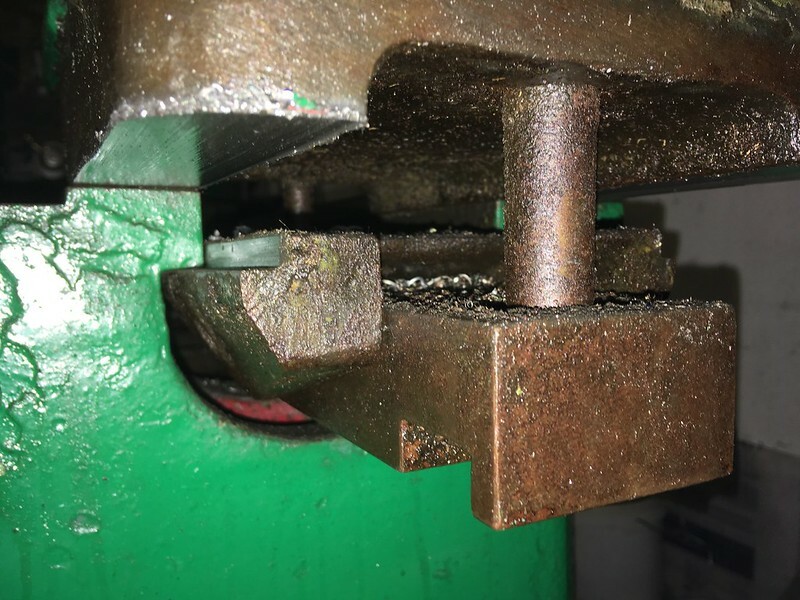 If it moves about, then the chuck backplate is either badly worn, or is not the correct backplate for the machine, or has been over-cut when originally machined. This isn't the end of the road for the chuck, if you don't mind messing about re-fitting it: Basically, re-install and tighten somewhat. Run the lathe slowly under power, note the high spot, tap with a rubber mallet/plastic or wooden hammer. Chase the high spots around until you've got it as true as you can, then carefully nip the bolts up, bit by bit, frequently re-checking runout. With care, you should be able to get it pretty damn close; certainly close enough to work with until you can replace the chuck and/or backplate. Thank you for your comments , much appreciated. I have measured the run out on the chuck back plate ( Max 0.001" ). Both measurements were taken with my trusted Mercer DTI. I have rotated the jaws , cant get better than 0.015" run out. All the jaws are a good fit into the chuck, no slop and what I can see of the scroll, it looks in reasonable condition but I have not taken the chuck off and stripped it down because it is freezing in the garage/workshop. Please correct me if I am wrong, do the jaws need re grinding ? All the mounting nuts back plate to headstock and cap head bolts back plate to chuck are tight. Pratt Burnerd in the USA inform me that this is a precision chuck, spare parts no longer available. Is it worth pursuing a second hand chuck ( which might be crap) but I do not fancy paying big £ for a Pratt Burnerd. This machine is in my opinion a classic icon. I have the "massive face plate " which an owner of and engineering company gave me. He stated his business on one of these and used it for many years. Now retired in the Bahamas. Great!!!!!! There are some Pratt Burnerd Jaws listed in Thame Engineering's catalogue. Regrinding will of course be cheaper and new Jaws won't cure a worn scroll. Some people salvage old Chucks by machining the Chuck register bigger then truing the Chuck up to suit each workpeice. I've just posted a video on regrinding the jaws on my three jaw chuck, it happens to be an Edgewick mk1! I hope it's of some use to you! Many thanks to VINTAGEANDCLASSICREPAIRS, TIMBY, MATTINKER and all contributors for their valuable input which is much appreciated. I will investigate the chuck more precisely and try to determine if it is the scroll or the jaws or both which are worn. If the chuck is beyond repair, has anybody got some experience with Chinese made chucks or an alternative chuck when compared to the super expensive Pratt Burnerd brand ? I do not want to go down the second hand route for obvious reasons. I have re measured the run out on my Edgwick Mk1 again. 10mm ground bar : 10mm run out. 25mm ground bar : +/- 2.5mm run out. Some sideways slop in jaws which was not evident before. It looks like the chuck scroll is badly worn and the jaw slop may be a problem but I have not stripped it down yet. Just wondering if it would be better to replace the chuck. I do not want to go to the expense of a Pratt Burnerd. Has anybody used and got any feedback on HBM and TOS chucks ?